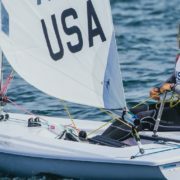 Katie Pettibone is part of the Easton/Pettibone Nacra 17 team competing in the mixed gender Olympic catamaran class. The Nacra 17 is the newest and fastest boat introduced to the Olympics. 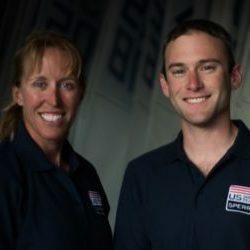 Katie is putting her many years of top-level racing together with Mike Easton’s catamaran expertise. After a strong start where they became members of the U.S. Sailing Team at their first regatta, the team has been training hard, competing in Europe and training on the East Coast and in Florida. This winter the team is continuing to practice on their new boat in Florida with top-notch coaches and previous Olympic-medalists Jay Glaser and Randy Smythe in preparation for the Olympic trials: the ISAF Sailing World Cup Miami and the 2016 Nacra 17 Worlds in Clearwater, Florida. Spring will take the team back to Europe to compete against top boats before heading down to sail in Rio. Katie was born and raised in Port Huron, Michigan. She grew up in a family of sailors racing around the Great Lakes and surrounding areas. Katie attended University of Miami, Fl and in her junior year she tried out and was chosen for Bill Koch’s historic first ever all women’s team to compete in the 1995 America’s Cup on Mighty Mary. 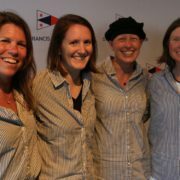 Katie continued to race professionally, competing in the 1997-1998 Whitbread Around the World Race on Team EF Education, the 2000 America’s Cup Team America True in Auckland New Zealand and then to the next Around the World Race- the newly named Volvo Ocean Race on Amer Sports Too. In between events, Katie went to law school in Sacramento, CA and became licensed to practice law in California and Washington D.C. Katie then went on to compete in the 2007 America’s Cup in Valencia, Spain with the French Team Areva Challenge, where she was the last female to be part of the sailing crew of an America’s Cup team. Katie’s racing experience also includes top-level regattas all over the world, including the classic Sydney-Hobart race, the Tour de France la Voile and the extreme Worrell 1000. She also currently works as a lobbyist in Sacramento, while working to build the Rising Tide Leadership Institute and its efforts to encourage women to compete in sailing in far reaching parts of the world, including the Middle East.